PEDOCs have Beautified Parkways, Safeguarded Communities and Provided Lasting Value for our Customers. This electric and lighting source was constantly being hit by mowing and servicing equipment. In deep snow it became a trip hazard and the outlets were nearly impossible to access. 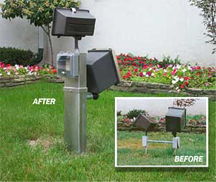 The PEDOC solution: an attractive and sturdily constructed electrical mounting post on which both lights are mounted and the outlets are clearly visible. Soil subsidence around this building caused the electrical wires to become severed. 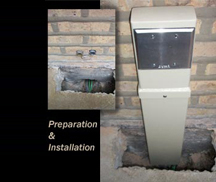 Installing a PEDOC pedestal allowed ample space for wires and cables to move freely in an enclosed space and withstand changes due to freeze/thaw cycles. 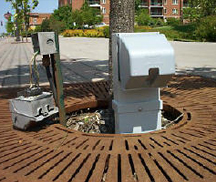 The pedestal shown here replaced an existing conduit/box configuration that had come apart, exposing dangerously corroded electrical wires. 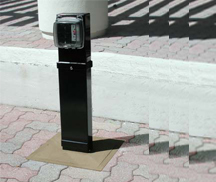 A PEDOC pedestal allows for installation one time and it’s done. 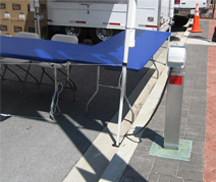 This PEDOC pedestal in use at a municipal festival, powering up a beverage truck, allowed for power at its point of use. No unsightly extension cords for festival attendees to trip over. Pavement Pocket PEDOC. Accessory option for mounting a PEDOC into a submerged box. The PEDOC is easily removed leaving behind a sturdy flat and safe surface able to withstand greater than 5 tons of weight. 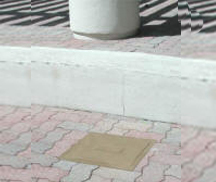 The pavement pocket is currently being considered for UL Listing.